House flipping is all the rage today. Fix and flip TV shows have certainly inspired people to purchase, rehabilitate and sell properties. Unfortunately, they oversimplify the system of flipping assets for money. This causes many first-time investors to overextend themselves. The shows don’t communicate the inherent paperwork or even decision-making ability demanded by the flipping business. They fail to mention the importance of building a flipping team to streamline things. Have you ever worked with people who are not a good fit because they do not have the needed skills to do the job? Nothing can be more frustrating on a construction project than realizing that the team is not up to the task. We all know what poor results look like. We can tell if something isn’t right when we see a house. Sometimes it’s obvious, and sometimes it’s subtle. When a project is not up to expectations with what buyers want the bottom line will suffer. The market is not bashful about screaming “NO” when presented with a sub-par remodeled house. The team that you put together is everything. Build the right team and enjoy success. Build the wrong team and you will not be able to get out of the flipping business fast enough. Below are a few things you should consider when building your own team. You need to choose a good general contractor with the craft skills to complete a renovation project. Most investors make a mistake by limiting their search to “contractor in my city” on Google. A search engine cannot know the best contractor for you or identify one who will complement your ideas. Additionally, some may have just invested in good web marketing agencies to push their websites to the top of Google listings. Take time to evaluate eliminate contractors with bad rating from Better Business Bureau or negative reviews from past clients. Look for contractors with prompt communication skills. Anyone who responds to your inquiry promptly deserves a phone interview. During the interview, get to know how many projectors the contractor is currently working on, whether they pull permits and if they have ever contracted on a house flipping project. Check to make sure that the contractor is licensed and insured. A good real estate agent will provide an extra pair of eyes and offer their expert knowledge of the local market. Additionally, they will help you come up with a realistic plan that allows you to execute projects as close to the schedule as possible. They analyze the market and recommend competitive prices that will attract buyers. When choosing a real estate agent, make sure that they match your level of commitment. The same procedures used to select a general contractor will come handy. Attending the local real estate meetup or REIA meeting may help expedite the process. You will meet plenty of agents at such meetings, and even get recommendations from other people in the industry. In addition to commitment, you should opt for an agent you feel comfortable working with. Establish a positive working relationship and this will benefit you greatly if you plan on flipping multiple properties. Your flip and flop deals will require money and as such, building a relationship with a reliable source of funding is important. There are many sources of funding and a hard money loan is one of the most popular. Hard money lenders have a lot of flexibility in their underwriting and act quickly, hence great to work with for flip and flop investments. When choosing the appropriate funding partner, be sure to read the reviews. Avoid falling victim to the bait and switch or catch and release tactics, which lure customers in but do little to help them. Flipping houses is a very different process than buying a personal residence. When someone buys a home that they plan to live in for a decade there is nothing wrong with improving the property to your likes and wants. In that case, the owner has to understand that it’s ok if they are purchasing for their own personal enjoyment and not profit, Furthermore, when it’s time to sell your personal residence there are specific steps to preparing your home for market. Take your eyes off the prize and you can really get yourself in a pickle and get stuck when you need to sell your property. Flipping a home for profit is an entirely different kind of animal. It’s all about the money. It has to be. It’s business. That being said, you can make fabulous gains turning homes. So, be inspired. 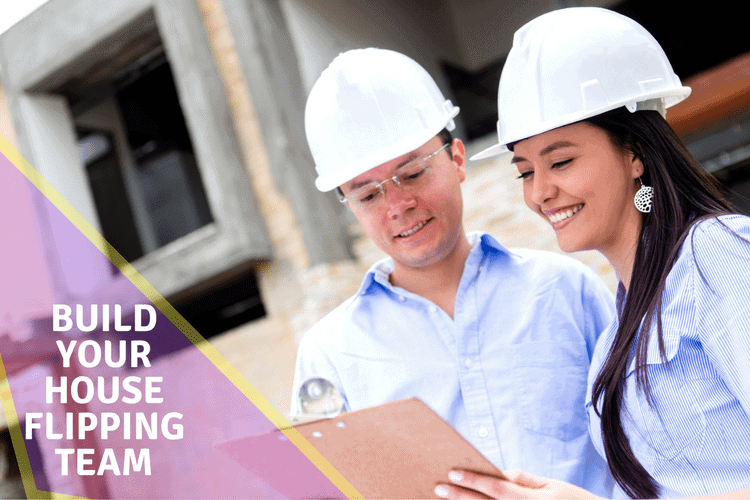 Build your team and start that house flipping project. We can help you make the connections you need to pull this off. Text or me at 1-480-442-3501 and let’s get you on the path to getting your first flip under your belt.